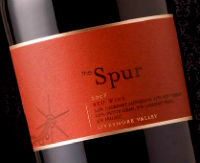 A few months back, I reviewed the 2008 vintage of Murrieta’s Well The Spur. Now, the 2009. The suggestion was to enjoy this wine with food from the grill. Unfortunately, I live in a place where grills are verboten — which kills me, because I love grilling — so I had to improvise. Since I don’t have a grill, I instead turned the toaster oven on “broil” and popped in a sliced vidalia onion and small filet mignon. Those two items were joined by fresh kale sauteed with bacon and onions and a sweet potato. Guess what? The Spur was a wonderful match with everything. As you might expect, it was particularly tasty with the beef, as it unlocked delicious flavors of sweet red raspberry, some black fruits, licorice, and cocoa. The fruity nose and juicy, almost jammy upfront flavors of this wine threw me off, because my initial impression was one of “typical sweet California blend.” However, that thought flew out the window quickly, as the midpalate and finish whacked me with ample acidity and firm tannins — so much so that this wine became difficult to enjoy on its own. For me, that’s a good thing, because in my mind, wine belongs on the table, to be drunk with food. The PR kit suggested barbecue, and I agree. The screwcap closure certainly makes it especially BBQ / picnic friendly. Would I buy this and bring it to an outdoor dinner party / picnic / barbecue? Absolutely — and I’d expect it to be a crowd-pleaser. This wine was also reviewed by The Frugal Wine Snob, Drinkhacker, and Pull That Cork, among others (if you reviewed it, or see another review, let me know in the comments).